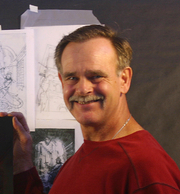 The award winning imaginative art of Don Maitz has appeared on hundreds of publications, and as concept art for two feature animated films: Jimmy Neutron Boy Genius and Ant Bully. Maitz created the Captain Morgan Rum character and his A-Maitz-ing images have appeared before a worldwide audience. Don Maitz is a LibraryThing Author, an author who lists their personal library on LibraryThing. Don Maitz is currently considered a "single author." If one or more works are by a distinct, homonymous authors, go ahead and split the author. Don Maitz is composed of 1 name.